qlinker, an initiative of housing corporation Mitros, has started to develop a new, digital housing corporation. The partner for the website and the app is OneShoe. With the future online platform, tenants can easily arrange all rental matters digitally themselves. Where and when they want it. The mission of qlinker is to make good renting better and easier. Much more direct and in your pocket! Really a new kind of housing corporation. Digital, and first and foremost with innovations to make renting and living as easy as possible for everyone. Central at qlinker is the tenant. One Shoe acts as a strategic digital partner and helps qlinker with the design, user experience and development of both the website and the mobile app. In addition, One Shoe advises qlinker on chosen techniques and design of the solution. In the future app, the chatbot of qlinker helps tenants with all the rental cases that occur. From finding a home to solving a leak. And if you still want to speak to someone? That is still possible. 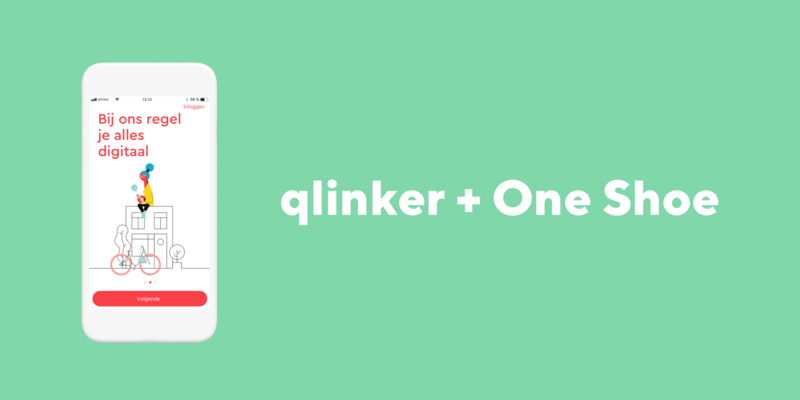 qlinker is digital but also likes to make it personal. For anyone who wants to rent in the social sector. Currently we are designing in an agile and iterative way, and we test various concepts for the digital solution with the focus on intuitive use. Of course accessible - also for tenants who still have to make the switch to 100% digital. To be continued! Already want to see more? Check qlinker.nl.